Visual Studio C++ Shared projects enable us to develop and shared arduino projects and libraries. Arduino development is simplified using Microsoft's C++ Shared Project Format. Shared projects are not tied to a single architecture, can be stored in any location, shared by unlimited Arduino projects and automatically show intellisense for the current "startup project"
Working with large and powerful api's such as the Adafruit MQTT and IO libraries transforms the speed of development and gives multi-platform live feed back and error detection via intellisense. Solutions can also contain multiple arduino projects, each arduino project can be associated to the same or different micro-controller. Intellisense in library sources automatkcally adjusts to the selected "startup" project settings. 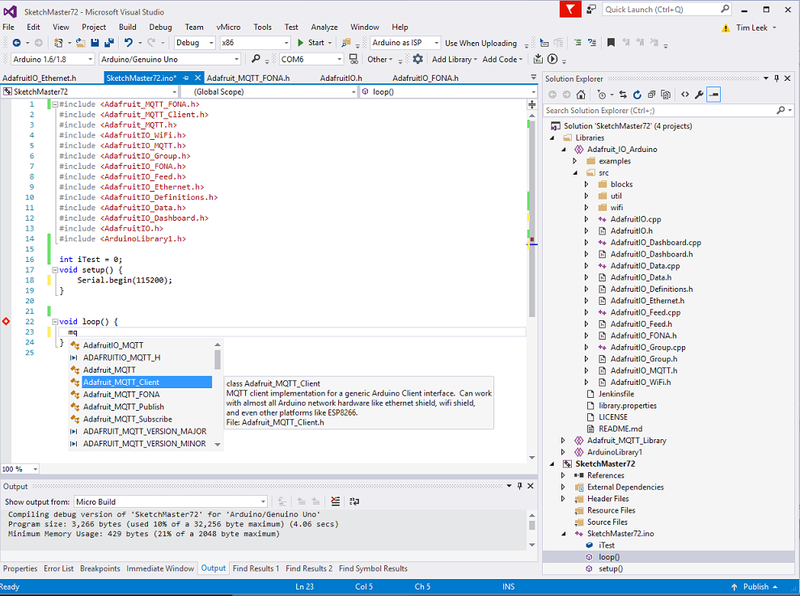 note: Licenced visual micro users have the added benefit of automatic shared project creation from any arduino library but it's not difficult to create a shared project manually using standard visual studio features.